Safak Demir, a mother of two and a teacher who was removed from her job as part of the Turkish government’s post-coup purge of dissident groups, has suffered a brain hemorrhage and passed away. 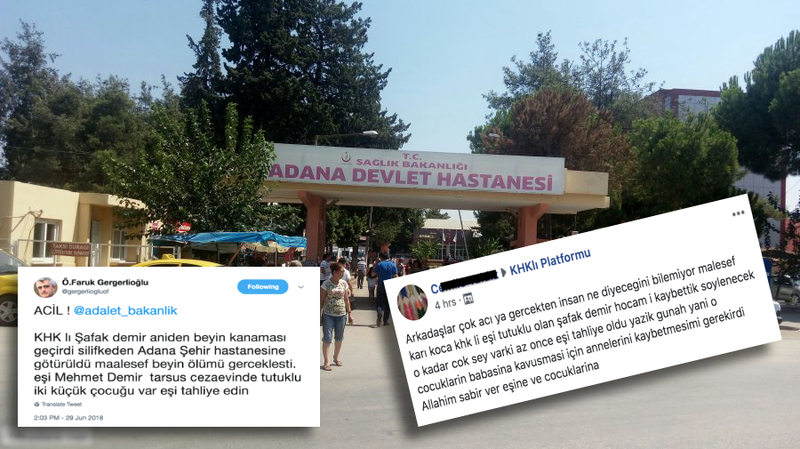 Demir had a cerebral hemorrhage at her place in Mersin’s Silifke and was taken to a state-hospital in the neighboring province, Adana, on June 29. “Unfortunately she have been declared brain-dead. Her husband Mehmet Demir has been jailed pending trial in Tarsus prison. They have two children. Free her husband,” Omer Faruk Gergerlioglu, a right activist and a Peoples’ Democratic Party (HDP) deputy, tweeted the same day. Gergerlioglu said in a separate posting that Ms Demir died on July 3. In a closed Facebook group, established by dismissed public officers for solidarity purposes, one of his colleagues said Demir’s husband was released only after Ms Demir was pronounced dead. More than 150,000 have passed through police custody and 90,000 have been arrested over ties to the movement since the summer of 2016. Meanwhile, over 150,000 people have lost their jobs during the same period.